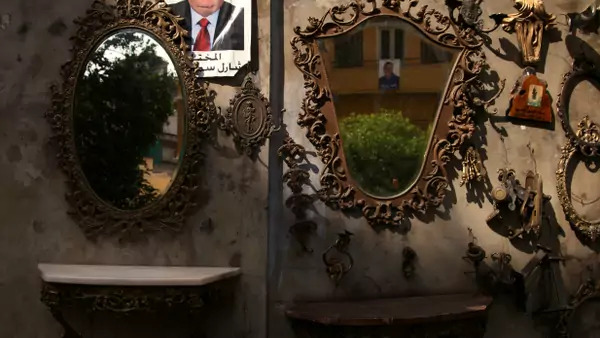 A picture of a candidate for municipality elections is hung near displayed mirrors of an antique shop in Beirut, Lebanon (Alia Haju/Reuters). Habib Battah examines the intersection of new and old in Lebanese politics in the context of Beirut’s municipal elections. Nektaria Petrou narrates her quest to find a renowned Armenian hand engraver in Istanbul’s Grand Bazaar. Alexandra Stock chronicles life in Cairo’s 10 Nabrawy Street through the eyes of its tenants in the days leading up to the building’s demolition.